Serve this classic thick Southern-style gravy over hot split and buttered buttermilk biscuits. Biscuits with gravy make a great breakfast with fresh or spiced fruit, or serve along with a complete breakfast with eggs or a breakfast casserole. The dish also makes an excellent special brunch dish. 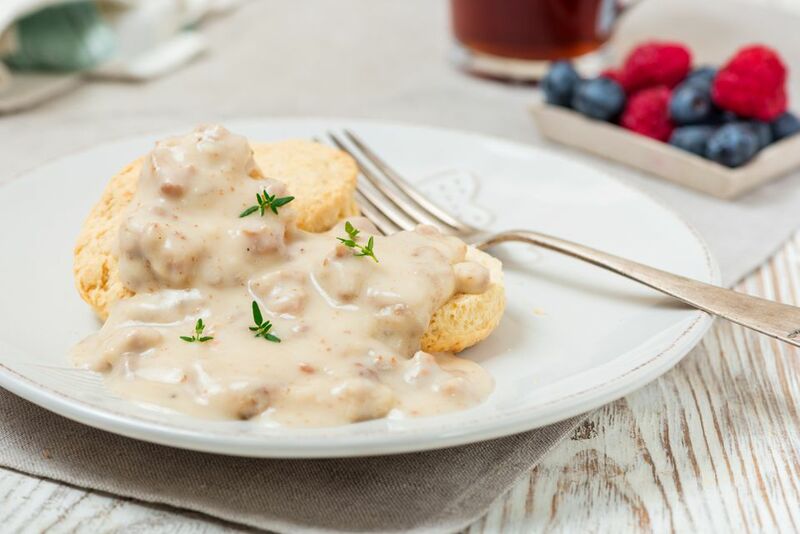 Serve the southern sausage gravy from a slow cooker or chafing dish and keep split buttered biscuits warm until serving time. Use your favorite variety of breakfast sausage in this recipe or try this homemade pork sausage or turkey sausage. Cook breakfast sausage in a medium skillet over medium-low heat, stirring and breaking up with a spatula. With a slotted spoon, removed the browned crumbled sausage to a paper towel-lined plate. Add 2 tablespoons shortening, vegetable oil, or lard to the drippings in the skillet. Add flour, stirring until blended and bubbling. Gradually add 1 1/2 cups milk; continue stirring and cooking until thickened and bubbly. Add the crumbled sausage. If too thick, add a little more milk. Stir in a dash of cayenne pepper, if desired. Serve over the hot split and buttered biscuits. Serve sliced tomatoes or fresh fruit with these, or serve as part of a bigger breakfast.